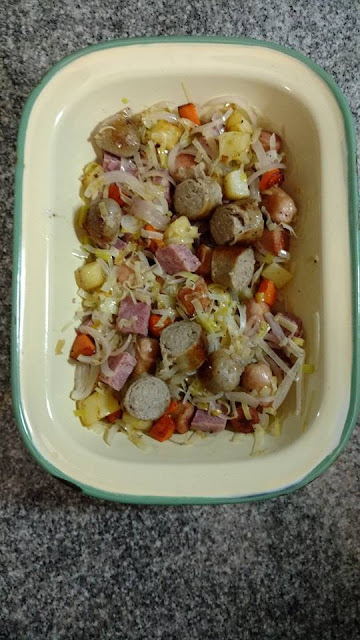 After the recent Hokus Porkus Piggy Bag event we did I had random leftover ingredients that weren't enough to be used on their own but could be combined with other things to make a good dinner. Thus was born another edition of my Freezer Clean Out Pies. I often throw together random ingredients from the fridge or the veggie box to use up bits of ingredients and it goes without saying that I do the same with stuff from my freezer. This time I had leftover cooked ham, puff pastry, and a leek, from the Ham, Potato and Leek Pies I'd made for the Piggy Bag orders. 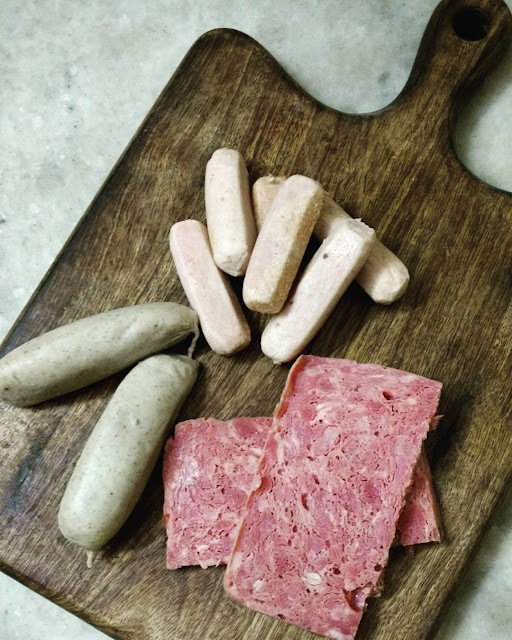 I also found a couple of sausages from the Sri Lanka stash, and another opened packet of cocktail sausages that I could use. The hubby wanted a pie for dinner and so that's what I made with some added ingredients to the leftovers and scraps. To start with prep the vegetables and the sausages. Heat oil in a pan, I used olive oil, and saute the potatoes and carrots till nearly cooked. Remove to your baking tin, and then saute the sliced leek and onion. Take your time with this and keep the flame on medium or low ensuring you don't burn or brown the leeks. Stir often and add a little oil if required. Once the leeks are soft and cooked and the onions pink pile them onto the potatoes and carrots in the baking tin. Now fry the sausages. Just heat them through and brown them a little. I left the breakfast sausages whole and cut them after frying because they tend to disintegrate if you cut them before frying. Once the sausages are done add them to the baking tin remembering to cut the breakfast sausages. Add salt and pepper and give the whole thing a good mix. Add the ham cubes too. Flatten everything so it's uniformly spread in the baking tin and then sprinkle grated cheese over the top. Make a white sauce - heat butter in a clean pan and sprinkle flour into it. Once again keep the heat at medium so you don't burn the roux. Once the flour has lost its raw smell (it takes just a minute or so) pour in the milk slowly whisking as you go and ensuring that there are no lumps of flour. Once the sauce is smooth let it come to a boil, simmer and let it thicken a little. Season with salt and pepper. You can add dried herbs if you like, I didn't. Pour the sauce over the pie filling and nudge the sauce into the filing so it's not just sitting on the top. On a clean work surface roll out the puff pastry to fit the top of your baking tin. Cut the pastry to fit the top of the filling properly. Cut out shapes with a convenient cookie cutter from the pastry scraps and decorate the top of the pastry. Use a dab of water to stick the cut outs to the pastry. Bake the pie in a preheated oven at 200C for 20 to 30 minutes till the pastry is puffed up and a pleasing golden brown. 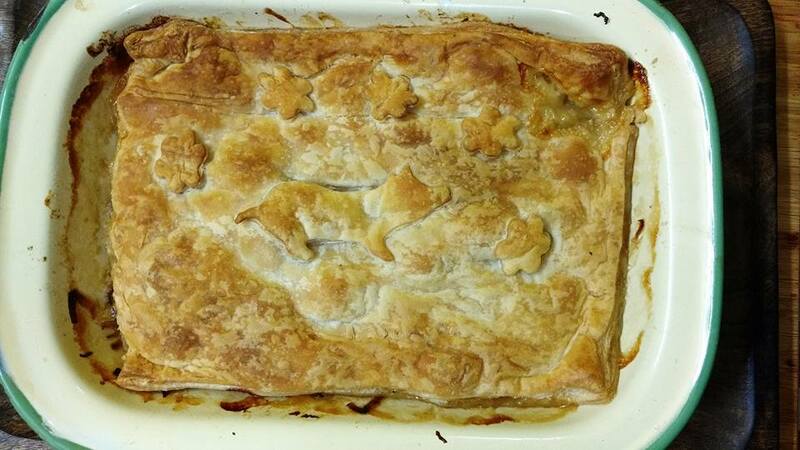 Pies like this one are easy to throw together and of course you can vary the ingredients as much as you like - play with cooked chicken, fish, prawns, mixed meats, go veg, whatever you like!